A tenner into O'Toole Park for Saturday's double-bill. All were glad of the team-sheets. Frank Brady had brought them over from Parnell Park. There was an All-Star in the house - Danny Sutcliffe. He struck a couple of birdies into the pitch and putt end in the second half. Then, in full flight, he managed to control the flying sliotar with one delicious touch of the timber. There were oohs and aahs from the crowd. All they were short of doing was bursting into a chorus of Danny Boy. Greg Bennett was centre half-back for Raheny. Still reading the play like the News at Ten. The climate brightened for the game. Jude's were always in the cockpit. They'll now have a date with Dalo in the last eight. Their full-back, Ger McManus, impressed. So did the centre half-back, Eoin McLoughlin. and Raheny's half-forward, Eoghan Smyth. Ger Coady showed his calibre at centre half-forward. He decorated his display with a collection of tasty points. David Henry showed quick feet and a clever use of the ball. 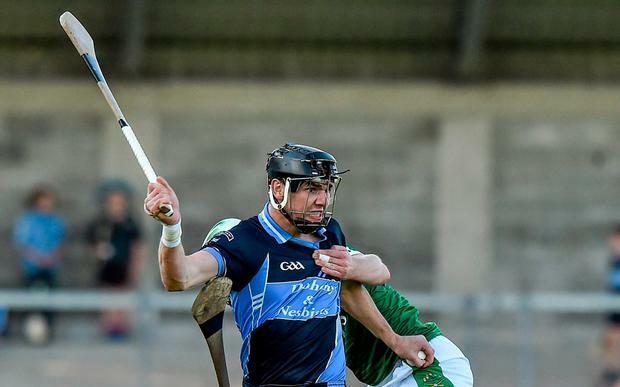 The Raheny 'keeper, Gerard Sheehy's intelligent short-pucks got the train going again. Fionn Ó Riain Broin was the evening's top teller. And he scored the goal ten minutes from time. Sutcliffe did the hard approach work for Fionn to crash the sliotar to the Raheny net. And before the close of business, he added a few more entries to his account. Scorers - St Jude's: F Ó Riain Broin 1-10 (0-9f), D McLoughlin 0-3, D Sutcliffe, L Sexton 0-2 each, E McLoughlin, R Joyce, M Brisbane 0-1 each. Raheny: E Smyth 0-5 (3f), G Coady 0-4, A Kelly, R Donnelly, S Grenham 0-1 each. St Jude's: D Walsh; K Treacy, G McManus, C Smith; A O'Beirne, E McLoughlin, C Ó Riain Broin; T Divilly, N Mangan; R Joyce, D Sutcliffe, M Brisbane; D McLoughlin, D Fox, F Ó Riain Broin. Subs: K Treacy for Smith (ht); L Sexton for Brisbane (ht); L Kelly for Joyce (42); M Malone for D McLoughlin (52); P Lavin for Mangan (52). Raheny: G Sheehy; E Fitzgerald, K O'Gara, D Keogh; D Henry, G Bennett, R Judge; M Grenham, E Keogh; E Smyth, G Coady, A Kelly; B McHugh, S Bell, F Smyth. Subs: R Donnelly for E Keogh (inj, 15); S Grenham for Bell (50); C McCarthy for Kelly (56).